Oxidus gracilis (?) (Greenhouse Millipede). Size: approx. 20 mm. Photo: 08/06/12, noon. 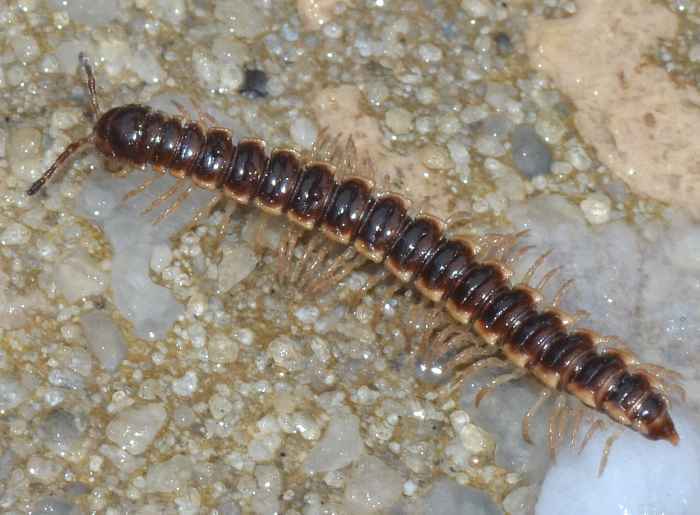 This millipede is in the family Paradoxosomatidae. A good guess is Oxidus gracilis. This very frequent species is a classic example of an exotic organism that has been introduced into distant parts of the world where the forces that hold its populations in check do not exist. It never feeds on living plants but exclusively on decaying plant matter. The second link states that the general appearance of O. gracilis is very similar to Orthomorpha coarctata. Both millipedes exist in Florida. They are active during the night but show the most activity in the morning.